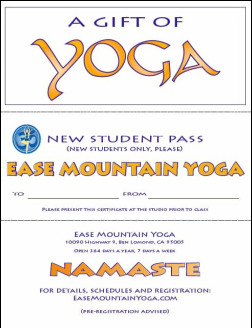 You can purchase a gift certificate for yoga and print it out! After you pay for your selected class or pass, you will be able to download a PDF file that you can print on a standard-sized piece of paper. The file can only be downloaded once. The price you pay for your gift is not indicated on the pass. It is important to clearly include your name in the "from" portion of the certificate so we can match the payment. We also have gift certificates printed on glossy heavyweight paper available for sale at the studio, and we are more than happy to print a custom certificate for you.